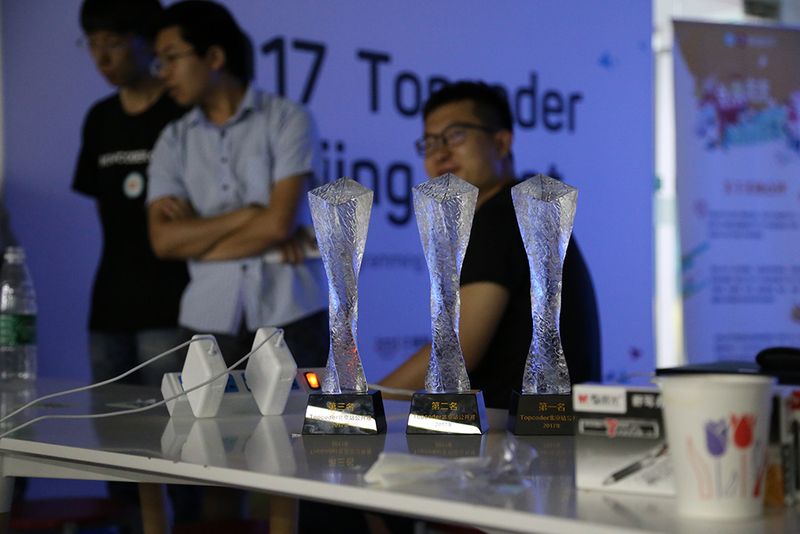 After an all amazing last year TCO16 Beijing Regionals we were very excited to go back and do an event in Beijing. The excitement grew even more when it turned out one of the biggest regional events we have ever done. 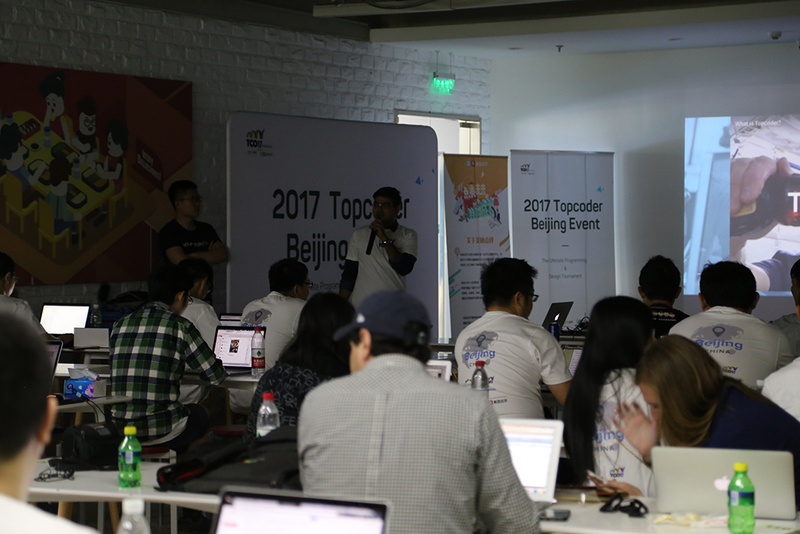 China is famous for Algorithm coders and having all the amazing greats come and code in one place onsite was indeed a treat to watch. 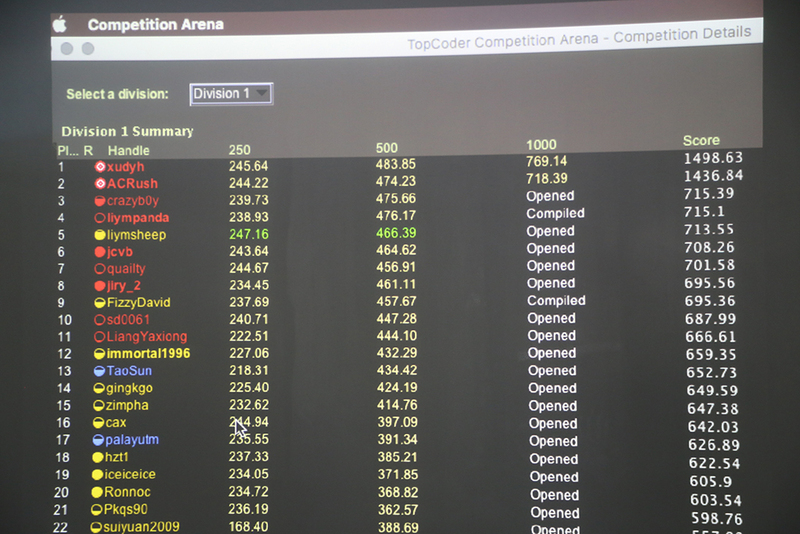 The big prize of the day was to get an exclusive chance to compete in Wildcard Algorithm Round for TCO17 Finals and fight for that was not an easy one with so many red and yellow coders coming to compete at the venue. 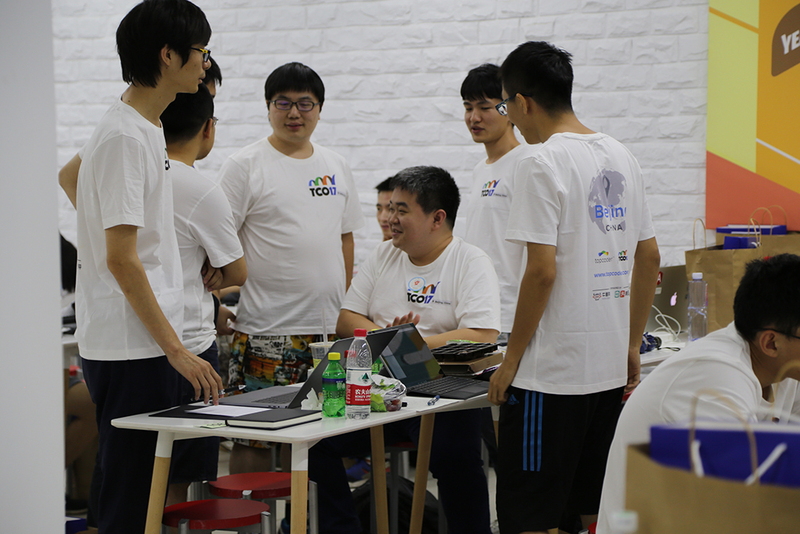 The event took place in the colorful space at Meituan Dianping Office. 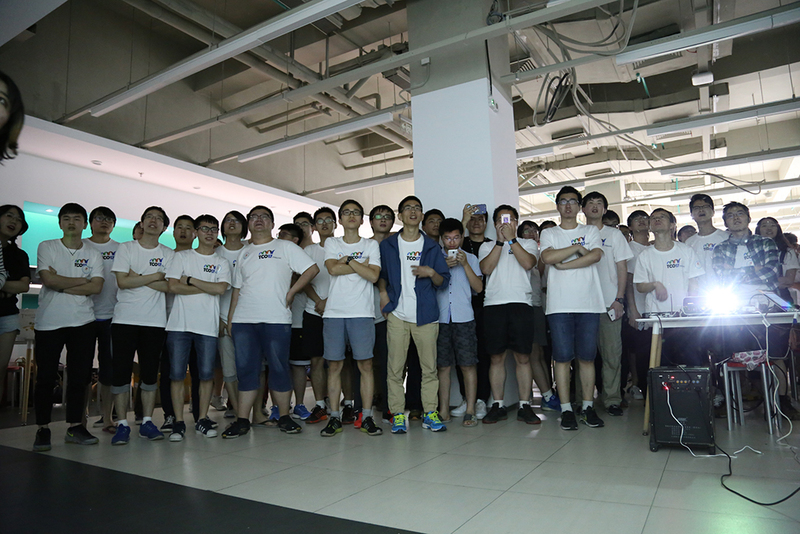 Big thanks to Meituan Dianping for providing us with such an amazing venue to conduct the event. The event was to begin at 12 and by 11:30 everything was set; the posters, the banners, the photo booth, registration desk, T-Shirts, and food. 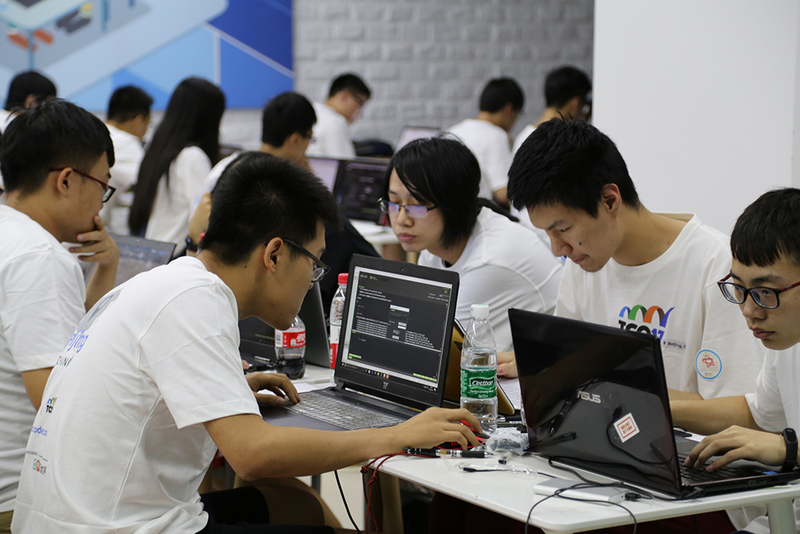 It couldn’t have been possible without the help of the crew from Nowcoder and Meituan Dianping. Many members had already made it to the venue by then and they were told to come in and grab their lunch. 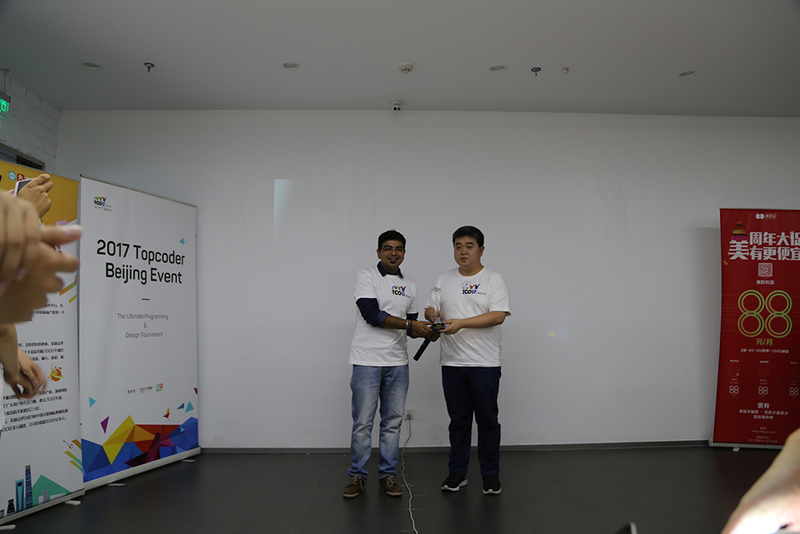 The first stop for the members was the registration desk to grab their sought after Topcoder T-Shirts and yes an amazing goodie bag from Nowcoder and Meituan Dianping. 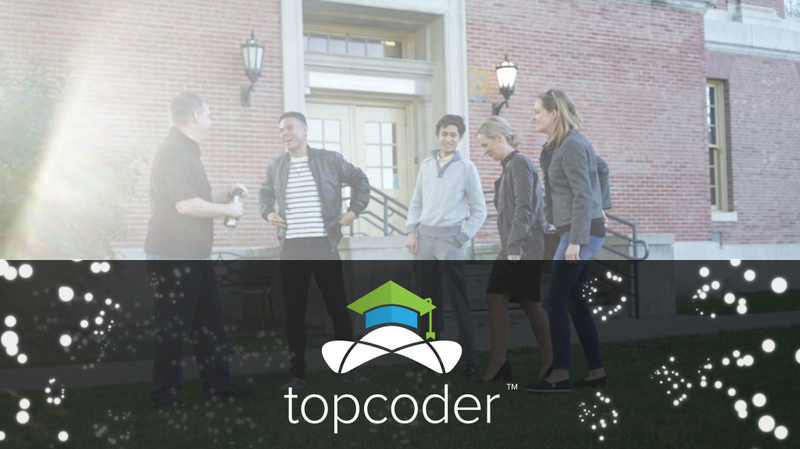 Very soon the venue was full of Topcoder t-shirts. 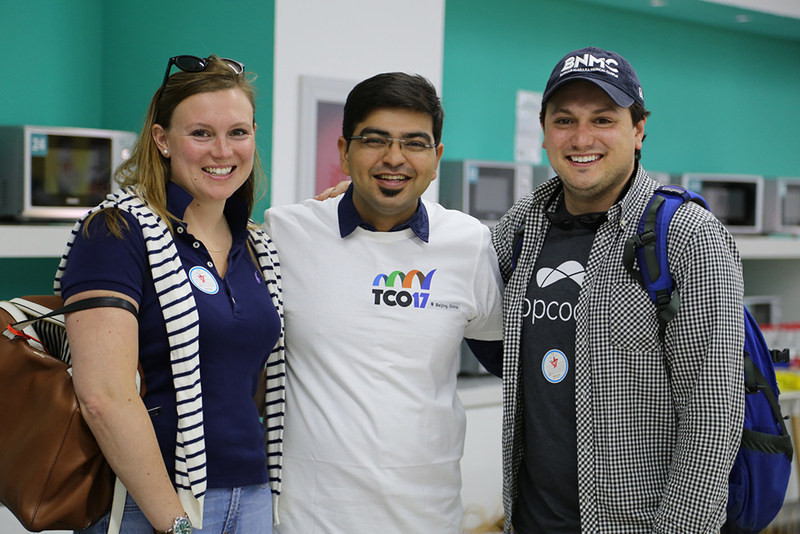 The pizzas and tech discussions have an old relationship when it comes to TCO events and similar thing was visible here. A few of the greats walked in the venue – ACrush, Xuydh, liympanda, liymsheep and we could sense the fierce competition. 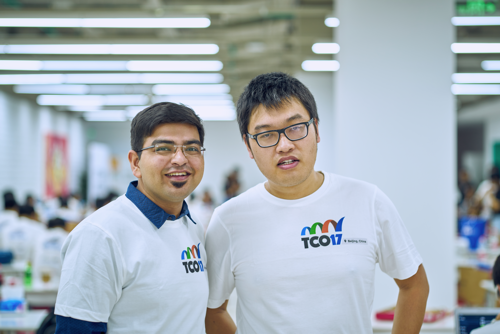 Soon the lunch was done and we were ready to officially launch the TCO17 Beijing Regional. I took the stage to officially launch the event and gave a small talk about what is TCO and what community means to us. It was followed by a small introduction of our new Cognitive Community. 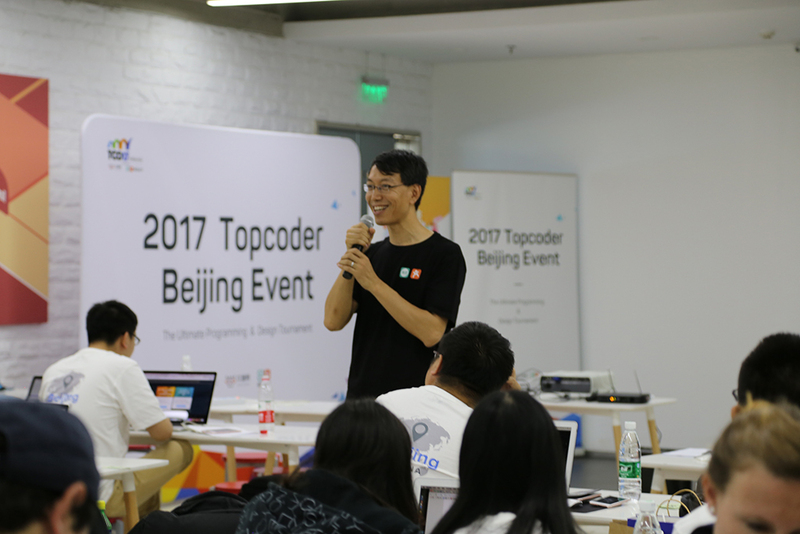 The introduction talk was followed by Xiangyu Ye (CEO, Now Coder) Nowcoder’s talk around how nowcoder helps members practice programming and it helps in getting good relevant jobs available in the industry. 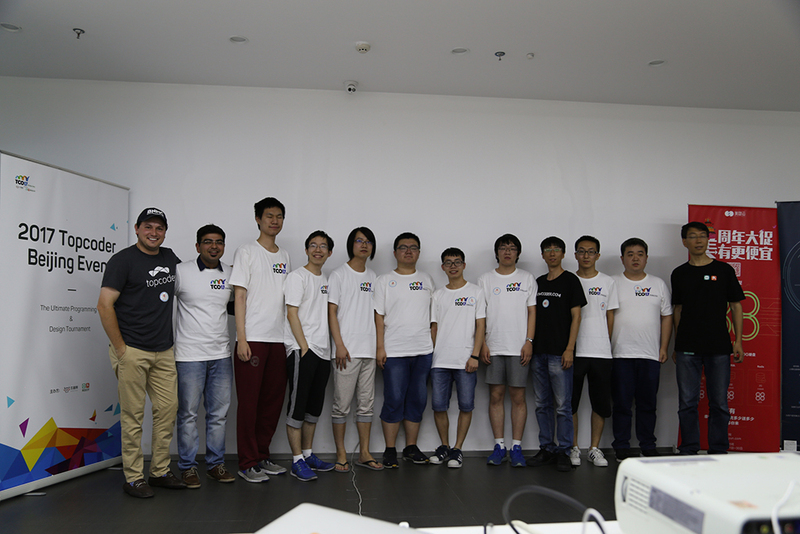 Later there was an interesting talk from Meituan Dianping representatives sharing about how “Internet has evolved over the years and how the Digital world is changing the way we lived our lives” was very much appreciated. 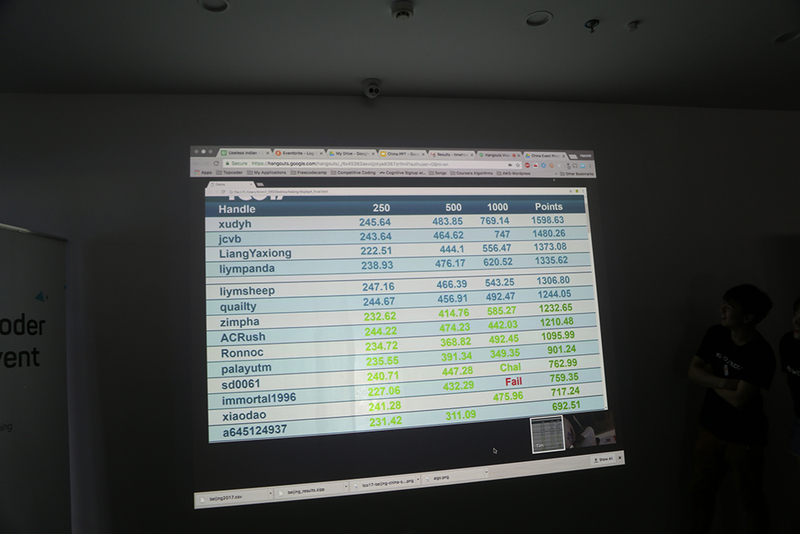 After the sessions we proceeded for a snack break and members were told to get ready, set up their desks and register for the Algorithm Match. As always, pin drop silence prevailed in the room and everybody was back to their machines getting ready to compete. The competition had Div2 level problems. You could see the the reds and yellows coming up and solving the problems very fast and moving up the ranks. 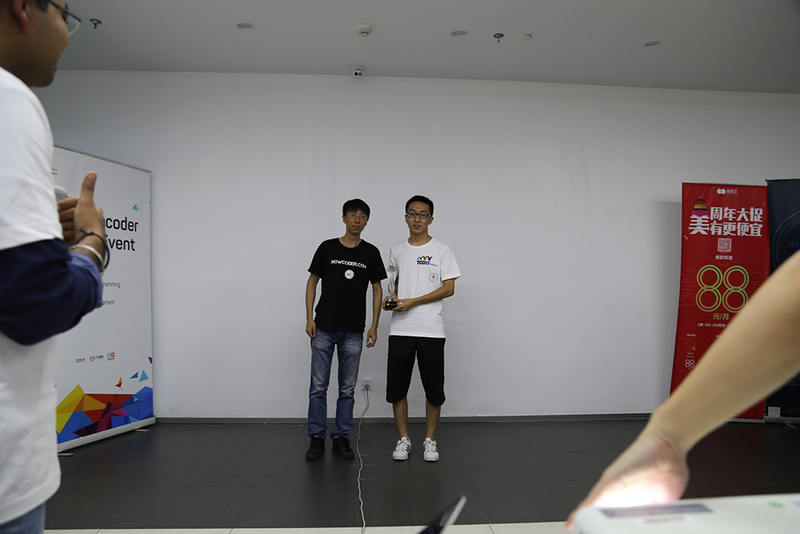 In around 30 mins from the start we could see the top seeded xudyh and ACRush had submitted all their problems. Unfortunately a resubmit on the last problem made ACRush loose almost 300 points and slip down 10 ranks before the challenge phase. The challenge phase saw a lot of newbies being challenged by the oldies who thus gained good amount of points on the leaderboards. 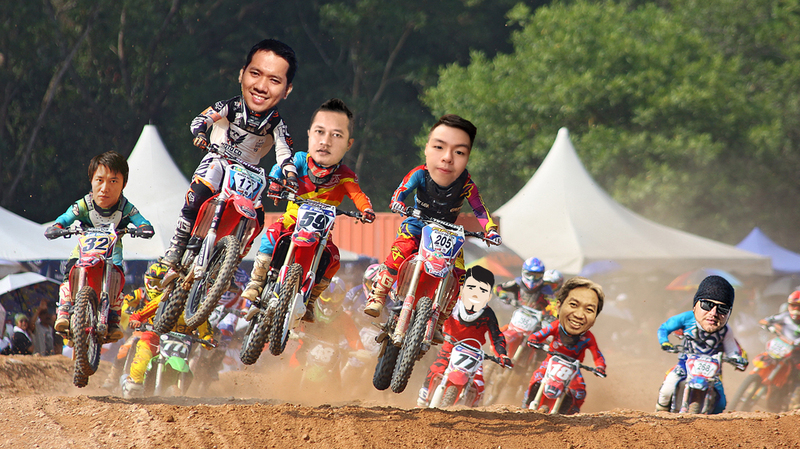 The contest soon ended and it was time for the results. 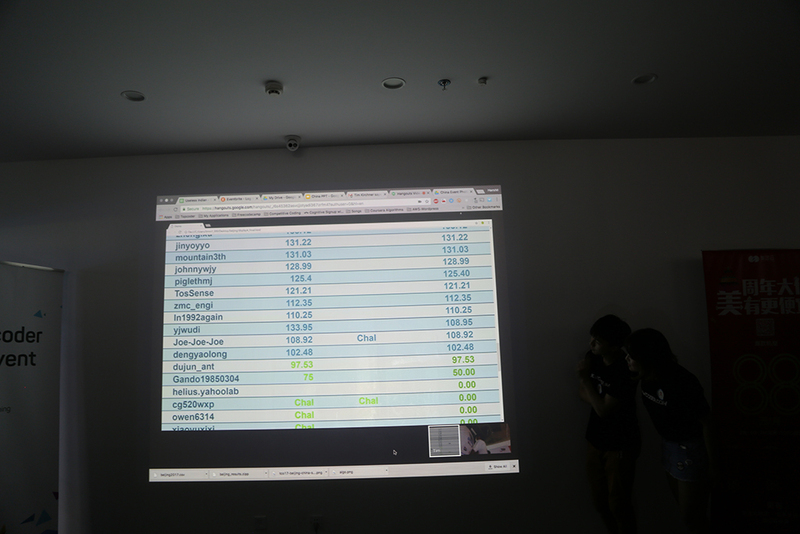 Everybody assembled around the projector and that moment was an amazing one. One could hear the oohs and aaahs on the System Test Fail of Codes. The biggest oohs and ahhs were heard when immortal1996 and jcvb’s 1000 point problem failed. 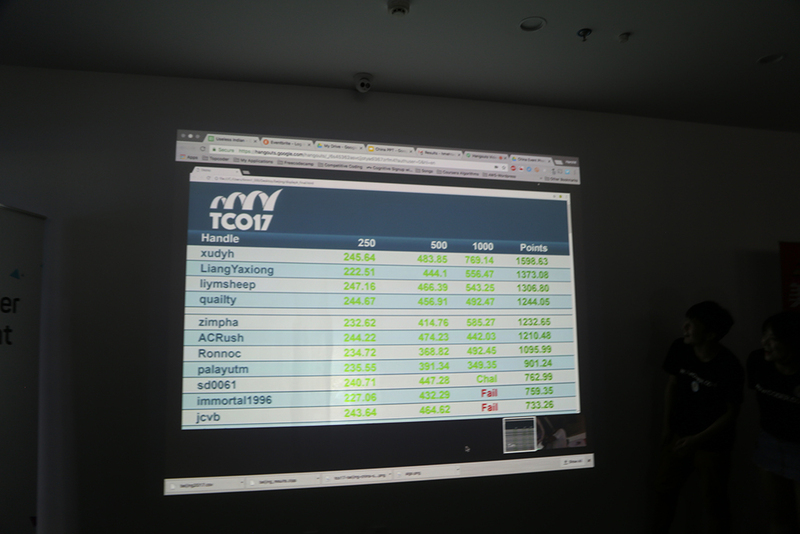 jcvb slipped from 2nd position to 11th position, thus losing out on a chance to make it to TCO17 Finals. 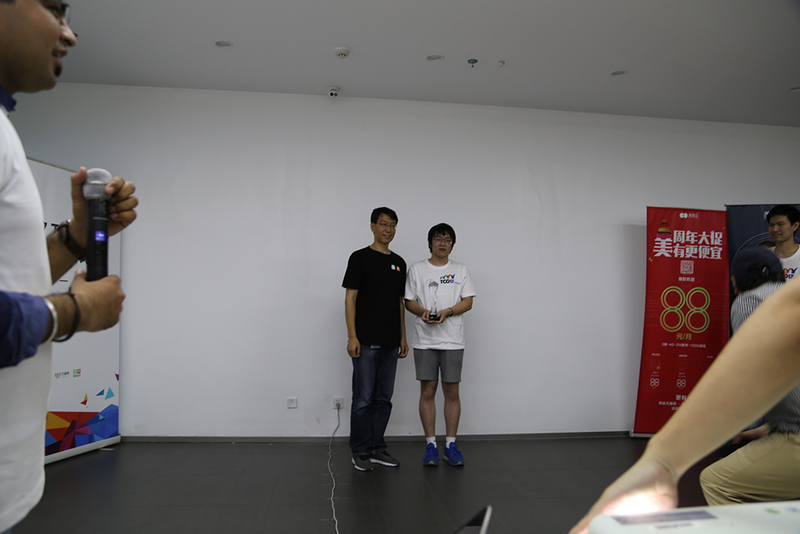 Top 3 xudyh, LiangYaxiong and liymsheep were felicitated with trophies and cash prizes. The Top 10 qualified for the wildcard round to be held on Sept 10, 2017. They will fight with the winners from other regionals to get a chance to fly to US for TCO17 Finals. 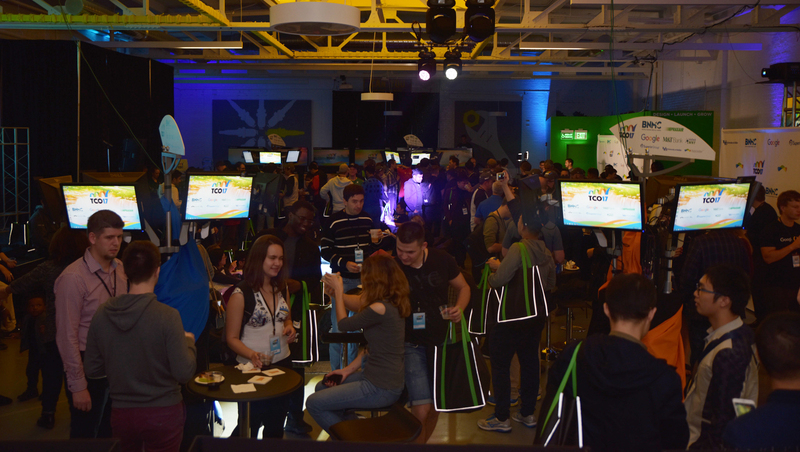 Thanks to everybody who made it to the event and helping us making it an amazing one. We hope to see you again next year.